Starting in late summer a dangerous game plays out at night again and again across rural and remote Ontario. Unlawful night hunting, often called “jack-lighting”, is an activity with unpredictable consequences – one that puts human safety and property values at risk. Unlawful night hunting is prohibited under Ontario’s Fish and Wildlife Conservation Act, 1997. Unlawful night hunting typically involves high-powered rifles being fired into the darkness at deer, moose and bear blinded by the beam of a spotlight. Often cast as an innocent pastime the dangerous reality is that the shooter has no knowledge of what lies beyond the intended target, it could be livestock, it could be a rural building or a parked vehicle or it just might be a person. 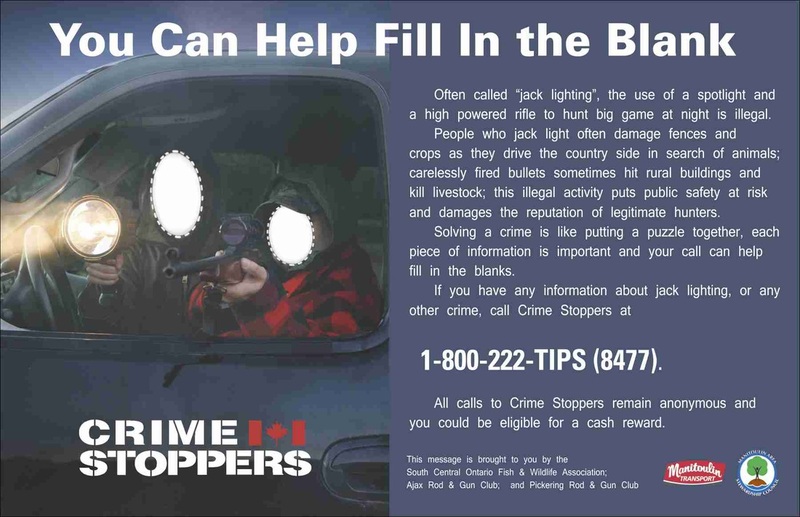 The risks do not end with the firearms associated dangers - agricultural crops may be damaged by vehicles driven through fields and gates may be left open releasing pastured livestock. In addition to putting public safety at risk and discrediting the reputation of the majority of law-abiding hunters, unlawful night hunting may result in the depletion local game populations by wounding and wasting animals. For more information please see the document above.